CHIEF ENGRAVER TO THE IMPERIAL OTTOMAN MINT. VIEWS OF SEBASTOPOL, BALACLAVA, AND KAMIESCH. CHARACTERISTIC GROUPS OF THE OFFICERS AND MEN. 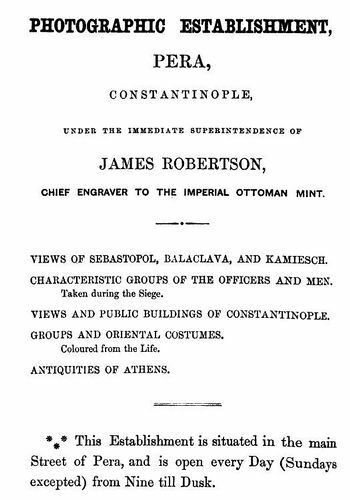 VIEWS AND PUBLIC BUILDINGS OF CONSTANTINOPLE. This Establishment is situated in the main Street of Pera, and is open every Day (Sundays excepted) from Nine till Dusk.